A detailed break down of the program is below. Echanted Camp is a week end long wide game. On the first Morning of Camp the Guilds (patrols) Dragon eggs are stolen by the evil Shadow Guild (we are lucky enought o have had 3 Junior Leaders attending the camp who filled this role for the weekend – a perfect role for them as they had a ball running around setting up bits of the wide game and causing havoc at the same time!) and the rest of the camp is spent journeying through the land to gain each Guilds Egg back. This is a camp that if prepared well before hand will run smothely and with little hassle at the actual event. Below is the detailed break down of the program and attached are all the widegame sheets, activity sheets ets that we used. 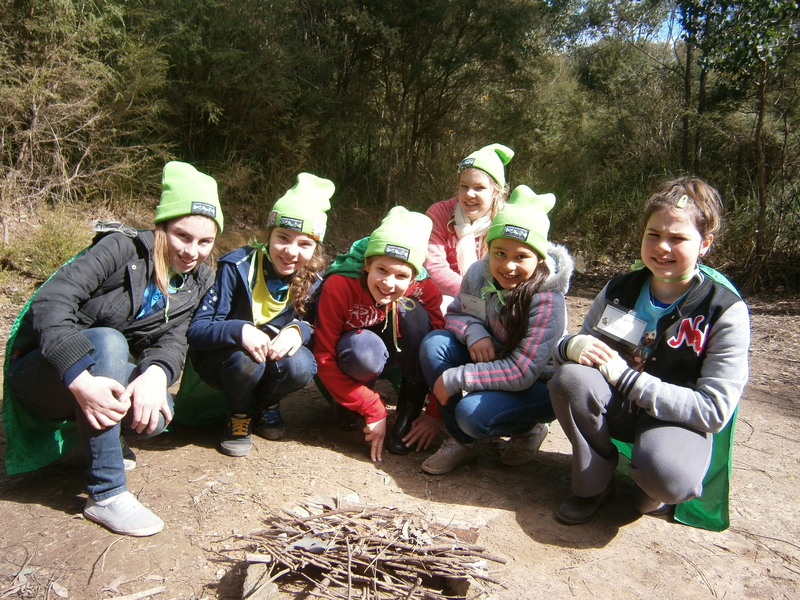 We ran this as an outdoors camp – but it could easily be run as an indoors camp or adjusted for a younger age group. Pens, Textas After the camp site is set up and dinner has been consumed – girls are given ten minutes or so to sit down and design their Guilds “Coat of Arms”, Get them to call on their new found knowledge of what a coat of Amrs is from their Jubilee challenge. And remind them simple is best.Once it has been desigined – have an area (maybe in the kitchen shelter?) where they can sit down and make it for each of their capes using felt and craft glue. Saturday 9am-10am Dragonlore lesson Dragonology BooksDragonlore bookletsDragon Script cards Each girl is given a booklet to work through and the dragonology books are supplied to the group.At the end of the hour the books are put somewhere the girls know they will be so they can come back to them whenever, and each girl is given a card with “dragon script” on it. Saturday 10.30 – 12 Fairy Forest Fairy Dust packets The Giants of GIlwell let loose by the Shadow Guild have destroyed the Fairy Village in the forest. Using what is around you (without damaging any plants) each of you can help by building a house or building for their village for them. It only needs to be fairy sized.To thank them the fairies give them each a specian puch of fairy dust. Saturday 1.30 – 2 Pixie Paths Tracking Cards (Junior Leaders to lay trail earlier)Follow the track that the Pixies have left to your next activity.Each girls gets a card with tracking symbols on it. Saturday 2-3pm Witches Warren WoolRibbonCraft Glue The witches have been watching you as you help out with all the havoc the Shadow Guild has been causing. To say thankyou and help you on your quest they are allowing you to make a wand.Find a stick that you like the size, shape and feel of and decorate. Saturday 4-5.30 pm Goblin Gully Clue sheetsPicture cut outsDisposable cameras All of the Goblin Queens friends have been kidnapped and spread around the land by the Shadow Guild.Using the list of clues she gives you, can your patrol get a photo with every friend to make the queen happy again?To reward you, you will each receive a packet of Goblin Sticks for each patrol – which may come in handy later on. Saturday 8.15 – 9 Lantern Game Lantern Set boundaries. One girl or leader takes the lantern and sits with it somewhere. The aim is to be the first person to touch the lantern without being spotted by the Guardian and having your name called. If this happens you have to go back to the starting point and start again.If you touch the lantern first you get to go and hide with it next. Stealth and ninja skills are a must. Tarps The Shadow Guild have left two of your leaders injured in the clearing – working together first aid their injuries and make a stretcher incase they are unable to walk. Sunday 11.00 Sorting Sorceress Fairy/dragon eggsBowls The Sorceress needs your help sorting the eggs and into colours and sizes – if you do this for her she will allow you to take some home with you. Silly string The Shadow Guild have given the Eggs they stole to the Dragon they control to guard. Try to sneak up and steal the eggs (like capture the flag) without being caught or shot by a member of the Shadow Guild or the Dragon.When you have captured your guilds egg help it to hatch.Inside each egg there is a dragon and camp badge for each girl to take home.